Firstly, look at that cover...Go ahead, I'll wait...Isn't it eye catching?! I know, I know, never judge a book by it's cover right? But this one gave me some serious cover envy. It's so enchanting. Almost Alice in Wonderland-like. As if the girl in the cover is falling down the rabbit hole; The initial reason I was drawn to this book was it's cover, then came the premise, how mysterious. The Love that Split the World was screaming READ ME! So, I eagerly obliged. This is one of those books that are really hard to review. I'm not struggling because this book had issues, in fact, it's the complete opposite! This book was unlike anything I've really read before. It is not your average Time Travel book, and I use the term 'Time Travel' lightly because I wouldn't even call it that. World-hopping? I don't know what to call it, but it was great! It's also not your average YA love story. Beau and Natalie share a chemistry that goes way beyond swoon-worthy good looks and butterflies in the stomach. They share a connection that radiates off the pages. A connection vibrates between them, even before their first kiss you can feel the strength of the bond between these 2 characters. When it came to Natalie, I adored her. She was equipped with a hilarious dry, sarcastic humour, smarts and a heart of gold. She also had the ability to make you feel every single thing she was feeling. Her emotions ran wild throughout the story and she took you with her. She whirled her story around your head and spun you in a sea of beautiful stories, love and, at times, extreme heartache. Grandmother was another spectacular character. Her beautifully woven stories will be unlike anything you've ever heard. You will devour every single word of each story she shares. She was a true gem. 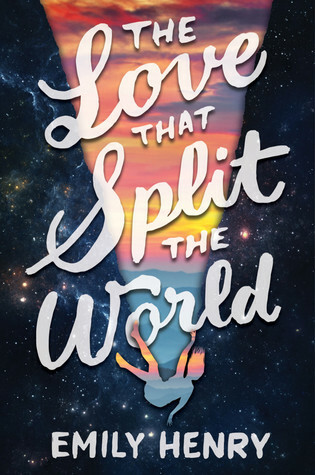 The Love that Split the World goes beyond time travel and romance. It is a story of a girl trying to find her place in the world and her heart-pounding journey to keep her place in it. It has laughs, thrills and chills. You will fall in love with The Love that Split the World!